Pre-engineered metal hangars cost less to buy, build, and own. More importantly, steel aircraft hangars also provide the best protection for your flying investment. Is it any wonder that steel frames almost every hangar you see? Most people may think of a hangar as a garage for airplanes. Pilots and aviators know better. 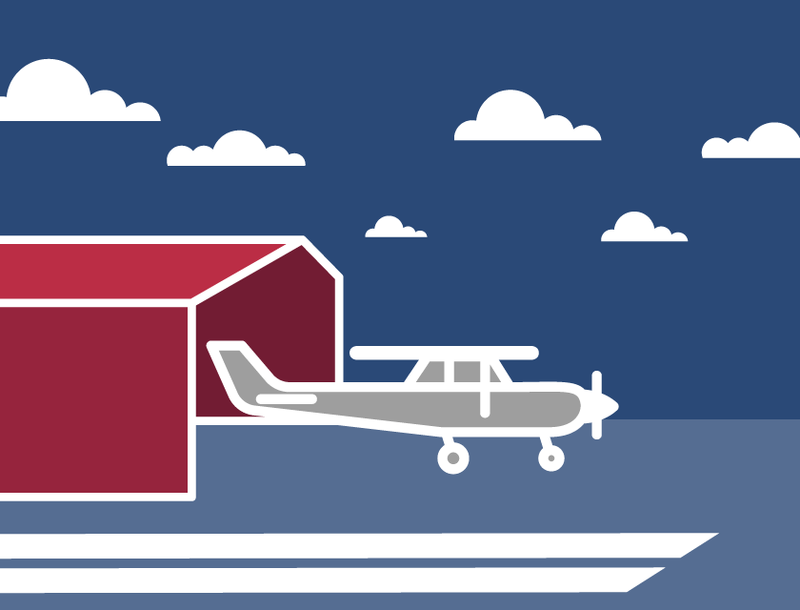 Every aircraft owner has unique needs— and great ideas— for their own perfect hangar. With RHINO steel building systems, you get exactly the hangar you need. It will meet all your specifications. Moreover, it will meet or exceed your current local building codes— guaranteed! How Can the Strongest Metal Hangars Cost Less? What could be stronger than steel? Steel’s strength-to-weight ratio is unmatched by any other building material. One hundred percent commercial grade red iron frames all RHINO steel aircraft hangars. Yet, prefabricated metal hangars cost less than other building systems. How do we do it? It is simple. Our steel is so strong that it takes very few pieces create a highly stable structure. Sophisticated steel design software creates the strongest possible structure with the minimum amount of steel. Factory produced steel building materials arrive ready to assemble. No cutting or welding is necessary. Consequently, the building materials not only cost less, but the structure erects much faster. That reduces construction expenses. RHINO metal hangars cost less to maintain and operate, too. Pre-engineered steel hangars stand up to Mother Nature’s temper fits better than other buildings. And, as a non-combustible material, commercial grade steel hangars earn big discounts on insurance. As an added bonus, our corrosion-resistant metal aircraft hangars hold their value decade after decade— and with virtually no maintenance! You choose the size for your hangar. Pick the aircraft door style and size that best fits your needs. Include space for storage, offices, crew barracks, or personal living. It is all up to you. Personalize your steel hangar with an array of accessories. RHINO offers gutter systems, skylights, energy-efficient insulation packages, personnel doors, and other many customizing features. In addition, RHINO’s high-quality steel exterior panels and trim are available in a rainbow of vibrant color choices. Get your hangar off to a flying start with RHINO Steel Building Systems. RHINO is no fly-by-night company. You can trust our sterling reputation for quality-made structural products— and our 20 years of top-flight service. Whether you require a corporate, airfield rental, or personal aircraft structure, depend on our RHINO-tough metal hangars and aircraft support structures. Call us today at 940.383.9566. Our steel building specialists are waiting to assist you! Share the post "Metal Hangars Cost Less"